The dramatic drop in the populations of Mediterranean and Black Sea sharks will have serious implications for the region’s marine ecosystem and food chains, the United Nations Food and Agriculture Organization (FAO) warned in a study released today. Over the past two centuries, sharks in the Mediterranean Sea have declined by more than 97 per cent in number and ‘catch weight,’ putting them at risk of extinction if current fishing levels continue. In the Black Sea, catches of the main shark species have also declined by half the number since the early 1990s. “This loss of top predators could hold serious implications for the entire marine ecosystem, greatly affecting food webs throughout this region,” says the study, Elasmobranchs of the Mediterranean and Black Sea: Status, Ecology and Biology, which was produced by FAO. The study found that sharks and rays are by far the most endangered groups out of 85 species found in the Mediterranean and Black seas. The two species are scientifically classified as Elasmobranchs as their skeletons are made of cartilage rather than bones. Their biological characteristics make them more vulnerable than bony fish as they have low fecundity, late maturity and slow growth. Due to their slow regeneration rates, they are highly susceptible to overfishing and to practices that degrade their habitat. While sharks and rays are generally not targeted directly, they are many times caught accidentally. However, the study shows that sharks have recently been targeted because of increasing demand for their fins, meat and cartilage. Shipping, underwater construction and mining, and chemical and sound pollution have also affected their numbers significantly. The FAO’s General Fishing Commission for the Mediterranean had adopted measures to protect sharks and rays such as the prohibition of ‘finning,’ which entails removing sharks’ fins and discarding the carcass, and the reduction of trawl fishing within three nautical miles off the coast to enhance protection of coastal sharks. The Commission has also recommended that countries in the region invest in scientific research programmes to identify potential nursery areas to protect juveniles of sharks and rays from fishing activities. Other initiatives undertaken by the Commission have included the organization of several meetings aimed at better understanding these species and supporting its members in the development of national plans to protect these key species. 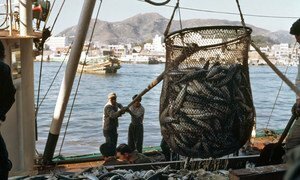 After years of negotiations, member countries of the United Nations Food and Agriculture Organization (FAO) today agreed on a set of voluntary guidelines that target illegal, unreported and unregulated fishing (IUU).